Suzuki Sake Brewery:PROJECT 2 DONATE:WA WA PROJECT-Social Creative Platform for Opportunity-Know and support projects in eastern Japan ! Suzuki Sake brewery was founded in Namiemachi, Fukushima Prefecture towards the end of the Edo era, advancing together with the fishermen as Japan's closest sake brewery to the sea. Standing alongside the fishing port as the feature of the local area, this brewery has continued to be loved by local people as it continues to produce sake that is a good accompaniment to fish. But 3.11 was the day when the hard work of the brewery workers was rewarded, to use a local term, with the 'koshiki (the wooden steaming basket used in brewing) being turned over'. 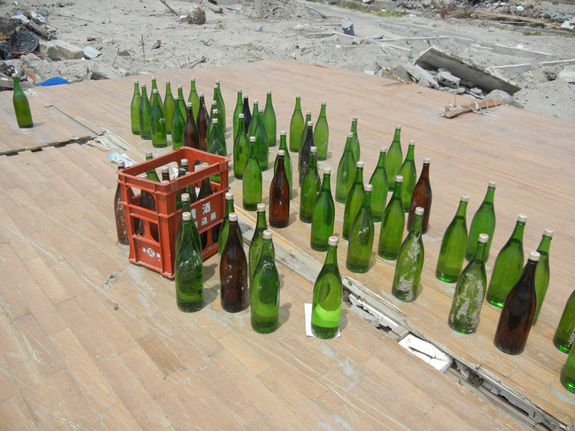 The brewery was washed away by the tsunami following the earthquake, and because it is located about 6 kilometers from the Fukushima Daiichi power plant, access is now restricted. However, Suzuki has already taken steps to rebuild his business in order to carry the flag for the famous local sake Iwasaki Kotobuki. As deposits of the starter mash needed for brewing still remained at the laboratory in Aizuwakamatsu city, Suzuki has started to reestablish sake production in Minami Aizu in order to connect, through sake, the people of Namiemachi who have dispersed in all directions. 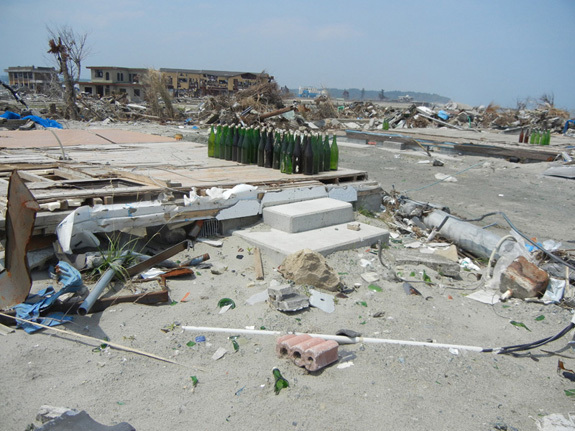 After the Great East Japan Earthquake,the further disaster at the Fukushima Daiichi Nuclear Power Plant resulted in a 20km evacuation zone being established around the power station as of 22nd April,and the residents of these areas were forced to leave their homes.Japan's nearest sake brewery to the sea,Suzuki Sake Brewery,founded in the late edo era,was located 7km from the nuclear plant in Namiemachi.Since its foundation the "Iwaki Kotobuki" sake has been held at the heart of the local fishing community as a sake for celebration and for life.However the 11th March was the brewery's final day.After years of work,a single event changed everything. "The tsunami came about 40 minutes after the quake.I am a member of the local fire rescue so I went around ordering people to take shelter,doing my best to call on all those who still had a chance to evacuate.The wind blew out across the sea as a large exhalation when at that moment a 10m tsunami came.My brewery was right next to the sea,so I was certain that it had been lost.But after this moment of realization I called everyone from the fire engine "Leave the vehichle,run!" and ran for escape." "Some how I made it to high ground and the next day while starting search and rescue the news of the nuclear power station came. As the fire rescue services gathered in order to search for survivors of the tsunami,we were forced to take shelter 10km away from the plant.We wanted with all our hearts to search for local people,but we had no choice but to remove ourselves with great pain.Since then I have not returned to my brewery,and it is as if I have no proof on my life.I think it is the same for many local people questioning "Who am I now? ",their identity being deeply shaken." The strongly regulated restriction zone.Two months after the disaster in May,bereaved families were allowed to return for a few hours to the town and set up alters.And at this time the sake of Suzuki Sake Brewery,which by some miracle was still left,was made in offering.Evacuated residents also raised their voices "some how please make your sake,please allow something of Namiecho to remain",and these words decided Suzuki's heart to restart sake production. "Until then I had freely thought that as sake is something that I make,it is something which belongs to me.However local people gathered their sake decanters and placed them at my place,they gave me much support and I came to strongly realize that the sake that has been made is something which truly belongs to everyone.The identity of local people has been shaken and those who are involved with my sake have made many sacrifices.Only I am able to make this sake,and through this making I hope to be a testament to the lives which have been lost.I also want to give evidence through the production of sake of my own existence." So with Suzuki's will and the ferment left from the brewery,the Suzuki Sake Brewery,with its history reaching back to 1830,has once again opened for business.However starting from the point at which the brewery and livelihoods of many have been lost is not an easy task. 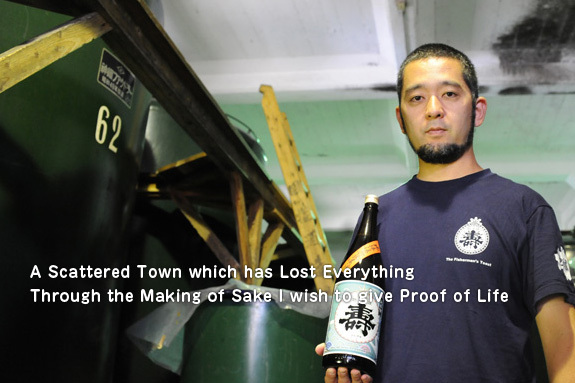 "It's likely that we will not be able to return to the place of the brewery for over 20 years.And it is now through the warm words of local people who have said 'if you make the sake,it doesn't matter where you make it,it will still be Iwaki Kotobuki sake',that I am determined to find a place for sake brewing,despite the fears of radiation etc.However the challenge is not only funds but also to build an environment in a new place with new people.For someone who has lost local support this is a big hurdle,but I wish to do all I can to make truly fine sake." In a time when our environment and our values have undergone drastic changes,Suzuki's sake production has taken on a new meaning. "For one month after the disaster I did not drink.Then I had some opportunity to drink with my colleagues in Fukushima prefecture,and at this time holding sake,we felt the importance and strength to move forward.While trying to share this feeling,I want to bring together the people of this town,who have been widely dispersed,in the production of sake and in the creation of a shared space." The Suzuki Sake Brewery, photographed during temporary access to the area. Local people collected the sake flasks they still had left and arranged them together. For all enquiries in English please contact to WA WA PROJECT who will be able to facilitate communication with the various groups and individuals introduced here. Connection through making. His home--sake brewery, was swept way. He left his home and lost his job, but reached out to his fellow sake makers. Together, they are gearing to develop their own product to re-develop the local identity and the fellowship among the brewers. Everyone is working for the job and neighborhood recovery and mind restoration. Sake brewery is the asset for the country. Toasting with a cup of sake is a symbol for sharing and connection. Through the sake brewery industry, rice makers and consumers are all linked somehow. I feel as a Japanese that we are responsible for trying to protect and sustain this sake brewery tradition and culture.